Day Parking is free for all attendees. Preferred Parking is available for purchase in advance. Parking lots open at 9am. All vehicle occupants must be wearing a Festival Wristband when entering parking lots. 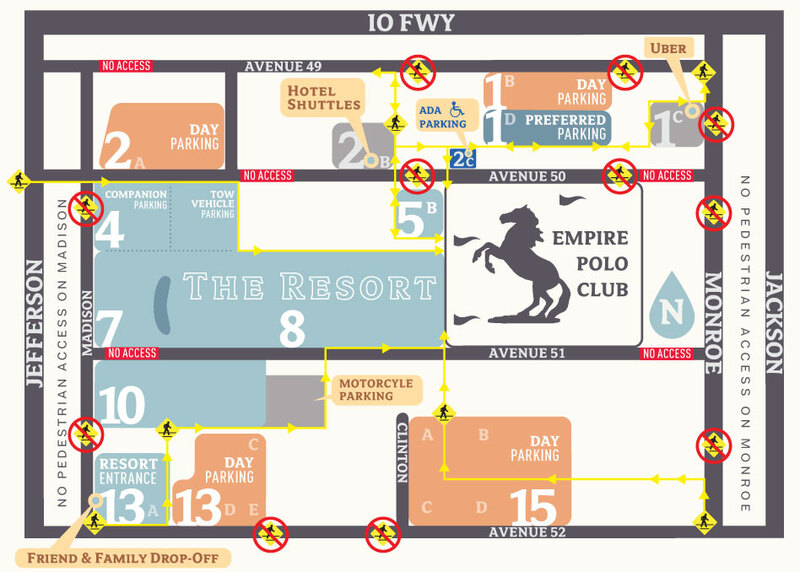 No RVs allowed in Day Parking, Prefered Parking and ADA Parking lots. To help preserve the environment, we strongly encourage carpooling! No overnight parking in Day Parking, Prefered Parking and ADA Parking lots. Overnight parking allowed in Companion Camping Parking (Pass Required). ADA placard must be prominently displayed. The person to whom the placard or plate is issued to must be present in the vehicle, as a driver or passenger. Law enforcement will be present to verify identification and placard properly match. You will need a verified ADA placard, permit, or license plate to enter ADA parking lot. All patrons inside of the vehicle must be wearing Festival Wristbands. For directions to ADA Parking, click here. Save a Horse, Ride a Shuttle! Round-trip shuttle service between Stagecoach and various local hotels. Shuttles depart for the festival from 11am-8pm each day. Return shuttle service ends 60 minutes after the music ends each night. Purchase a Shuttle Pass + GA Festival bundle and save $15. An Uber stand will operate at Ave. 49 and Monroe St. Follow the Yellow Path to and from the festival. Shade and phone charging is available while you wait for your ride. Expect the highest wait times between 12am-2:30am each night. Check all product types for the shortest ETA. Located at the corner of Ave. 52 and Madison St. Enter from Madison. Taxis may also use this lot. Enter festival site at the corners of Monroe St. & Ave. 49 or Monroe St. & Ave. 52 or Madison St. & Ave. 49 & Madison St. & Ave. 52. Absolutely NO PEDESTRIANS permitted on Monroe St. between Ave. 49 Ave. 52 and on Madison St. between Ave. 50 and Ave. 52. Multiple stations and bus stops in the Indio area. Can accommodate all size jet aircraft. No noise curfews 24/7. Can accommodate small jet aircraft. Turbine operations prohibited after 11pm. We operate an on-site Drop-Off area for licensed black car and limo services (Pass Required). Drop-offs are allowed from 9am-10pm. Car services wishing to utilize this area must apply for a pass using this form. This includes limousines, party buses, SUVs, rogue or non-sanctioned shuttles and all other vehicles making multiple trips to pick up and drop off patrons. No commercial vehicles will be given access to Preferred Parking lot or Ave. 49 without the Black Car/Limo Pass. Any vehicles without this pass must use the public pick up/drop off area at the corner of Madison St. & Ave. 52.